The Barwon Water development is located on the Victoria surf coast, in the township of Torquay, 20 minutes from Geelong, the largest regional city in Victoria. When complete, SALT Torquay will provide a community of 81 efficient homes of villas, townhouses and units in lots ranging from 300m2 to 830m2. The development is located close to schools, amenities and public transport, with pedestrian and cycling paths connecting to amenities, sports facilities and beaches. 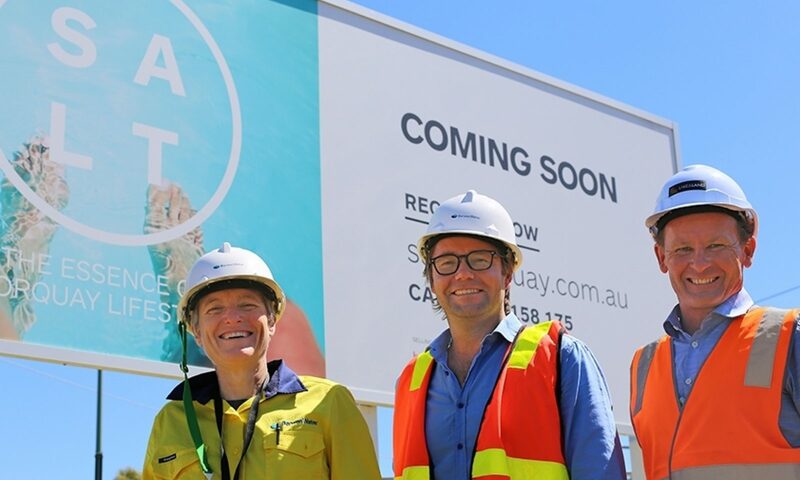 Barwon Water Acting Managing Director Jo Murdoch said SALT Torquay offered many long-term advantages through being a sustainably designed and built estate. The SALT Torquay One Planet Action Plan demonstrates leadership across the ten principles of One Planet Living. It provides a clear outline of the commitment by Barwon Water to increase community health and wellbeing, reduce emissions, and targets 100% renewable energy onsite for residents. Onsite photovoltaic solar electricity generation coupled with battery storage, electric-only residential appliances, and thermally efficient housing will significantly reduce emissions onsite for residential end-users. A solar farm on adjacent land will provide offsets to the grid. Homes will provide infrastructure for fast electric charge stations and bicycle storage, with access to active and public transport. Resident guides and a community facilitator will assist community in living more sustainably.